This Is Why You Buy A Sprinter Van!!!!! – Dave the #NVguy now at Garlyn Shelton Nissan in Temple Texas, is your Nissan Fleet and Commercial Sales Specialist. This Is Why You Buy A Sprinter Van!!!!! This is life at its best! 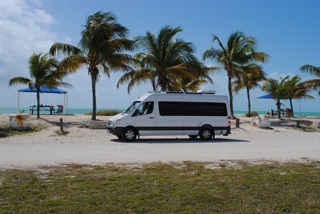 Taking your Mercedes-Benz Sprinter Van, with a Sportsmobile RV Conversion, and park it on the beach, 100 yards from the most southern part of Florida in Key West. Thanks to Jim for sending me this picture of where he is today. Maybe the Sprinter Guy needs to set up a mobile office there?. Operate your Business from a Sprinter van!